The Warriors rolled into Cleveland on Wednesday to face a very different Cavaliers team than they're accustomed to seeing. The result, however, was very familiar. 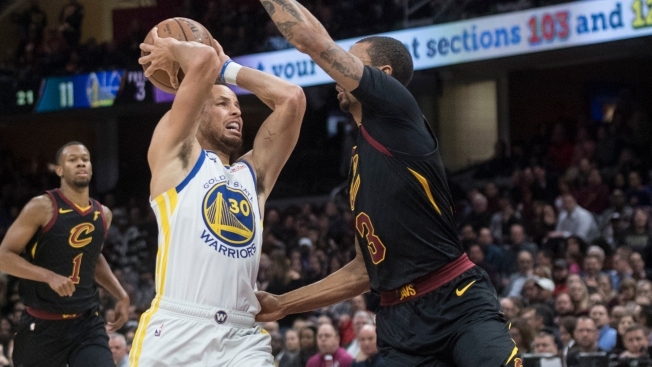 With Stephen Curry and Kevin Durant combining for 67 points, the Warriors overcame some early sluggishness and coasted to a 129-105 victory at Quicken Loans Center. This was the 12th time in 13 games, including the postseason, that the Warriors have beaten the Cavaliers. With 25 points on 8-of-13 shooting, including 6-of-9 from beyond the arc, Stephen Curry kept the Warriors close through the first half and into the third. Then came Durant, who was mostly quiet in the first half, to take over the third quarter. He poured in 15 points on 6-of-9 shooting, including 3-of-5 from deep as the Warriors outscored the Cavs 37-22, turning a six-point halftime deficit into a nine-point lead the Warriors never lost. Cleveland was done, courtesy of the Curry-Durant tag-team. Curry finished with 42 points on 11-of-20 shooting, including 9-of-14 from deep. He added nine rebounds, seven assists and was plus-22 in 34 minutes. Durant came within one assist of a triple-double, totaling 25 points, on 9-of-16 shooting, including 4-of-7 from deep. He added 10 rebounds, nine assists and two blocks. When Curry and Durant are scoring with this level of efficiency, opponents are practically helpless. After a couple games in which the reserves made little or no impact, the group performed very well against the Cavs. Alfonzo McKinnie was solid in his return after a nine-game absence, with 5 points and five rebounds in 13 minutes. He was plus-22. Jonas Jerebko, spending time at center and power forward, was terrific. He totaled 11 points (4-of-4 from the field, 1-of-1 beyond the arc), a season-high five assists and four rebounds. He was plus-25 in 22 minutes. Shaun Livingston and Jordan Bell also contributed at both ends, as the Warriors reserves shot 14-of-23 (60.9 percent) from the field. If Kevon Looney, shoved into the starting lineup due to the injury sustained by Damian Jones, keeps this up the Warriors can afford to be patient in exploring the market for veteran centers. After scoring a career-high 14 points on Monday in Atlanta, Looney came back for 8 points, six rebounds, three assists and a block against the Cavaliers. Looney never appears to be in a rush. He doesn't jump particular high or run exceptionally fast. He just gets the job done, almost every time.